Old-Time super group Sausage Grinder will be performing at the Berkeley Old Time Music Convention (BOTMC) on Thursday, September 27th at the Freight & Salvage along with Dom Flemons, Paul Brown and Mike Bryant! Tickets are available HERE. Sausage Grinder members David Bragger & Susan Platz will also be teaching their popular Double Fiddle workshop on Saturday, September 29th at 3:00. Register HERE. Sausage Grinder’s Chris Berry will be teaching a Dock Boggs Banjo Workshop the same day and time. Register HERE. 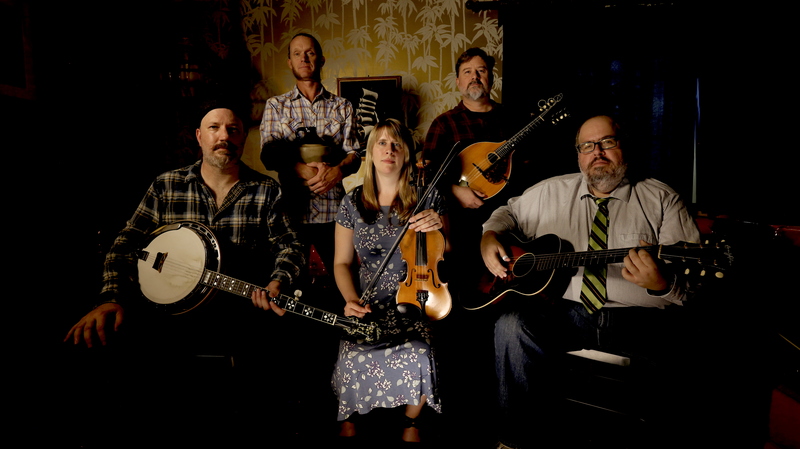 Sausage Grinder, from Los Angeles, combines the sounds of fiddle and banjo breakdowns with the country blues, topped off with a touch of ragtime and hillbilly jazz. The members of the band are David Bragger, fiddle, mandolin, banjo; Susan Platz, fiddle, banjo, washboard, vocals; Chris Berry, guitar, banjo, vocals; Pat MacSwyney, mandolin, tenor guitar, jug and Timothy Riley, jug, washboard, jaw harp, saw, bagpipes, mouth harp, mandolin, guitar, vocals. David is the proprietor of the Tiki Parlour label, which issues recordings and videos of old-time music, and has recorded an album of old-time fiddle duets with Susan, some of which will be included in Sausage Grinder’s concert set.